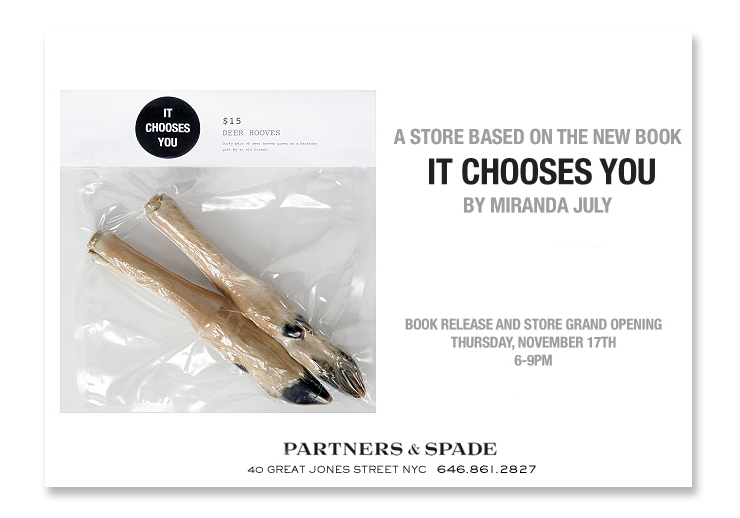 Partners & Spade held a reception and temporary gallery for Miranda July’s: "A store based on the book". The concept was to collect interesting collector items off craigslist, interview the owners of the item, and vacuum seal the pieces and sell them in the store. I collected these items off New York City's craigslist, interviewed each of the owners, and designed the invites along with the packaging labels with the interviews on each piece. I also set up the gallery space for the release of Miranda July’s book, “It Chooses You”. Created under the direction of Anthony Sperduti.